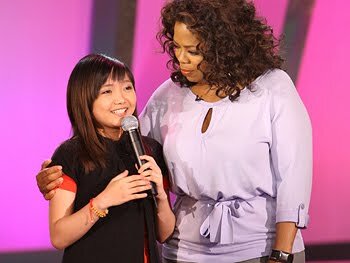 Charice, name no less by Oprah Winfrey as the Most Talented Kid in the World is set to return to the Oprah Winfrey Show on her birthday on May 11 to promote her first international album. Oprah is one of the 13 million people who saw Charice in Youtube. She invited Charice to her show in her segment, "The Most Talented Kid in the World." Oprah was blown away by her jaw dropping performance. And from there, Charice singing career has reached to it's height. Oprah says there's nothing more fun than helping to make someone's dreams come true…especially when that someone is a gifted young person who really wants it and really deserves it. Her single "Pyramid" are getting on the top on billboards in USA and European countries beating Lady Gaga's Bad Romance. Charice will celebrate her debut in the Philippines with the street children.